Have you ever read Ezek 44 You will notice in verse 6-10 “Now say to the rebellious, to the house of Israel, ‘Thus says the Lord GOD: “O house of Israel, let Us have no more of all your abominations. “When you brought in foreigners, uncircumcised in heart and uncircumcised in flesh, to be in My sanctuary to defile it–My house–and when you offered My food, the fat and the blood, then they broke My covenant because of all your abominations. “And you have not kept charge of My holy things, but you have set [others] to keep charge of My sanctuary for you.” ‘Thus says the Lord GOD: “No foreigner, uncircumcised in heart or uncircumcised in flesh, shall enter My sanctuary, including any foreigner who [is] among the children of Israel. Chris how should we as the temple of God (the church) allow the uncircumcised into to have fellowship with us? Answer we can’t and should not. Our work is to Go into all the world. God’s work to to the church those being saved. Period. Then we are to disciple the babies until they are mature. “And the Levites who went far from Me, when Israel went astray, who strayed away from Me after their idols, they shall bear their iniquity. I have considered it, and don’t think it applies. I simply don’t see the apostles or the disciples excluding non-believers from their assemblies. We are in a different covenant. Thankfully, a new, better covenant. The old mosaic covenant is obsolete and does not apply to us nor has it ever. It was made between God and the nation of Israel at that time. If we invite non believers to our church and they come, shouldn’t there be an alter call (can’t find alter call in bible) so if the non believer wants to know anything about JESUS he could go forward if he chose to. Without an alter call maybe the unbeliever would just go away And forget about the whole thing. I agree with you on this subject. I have known several people even friends of mine who are saved today as a result of having been invited to church. Also I am amazed at the people I meet who say that you should not invite unbelievers in and they are not out winning souls. @ Claudette While “Altar Call” is not a biblical term, the idea of calling for a response is approrpriate. This is an appropriate response when preaching evangelistically in a church setting. I do it every now and then. But if you as the preacher know that you are preaching to believers, the altar call should be something to invite believers to respond in some way. No point in giving an evangelistic altar call if there are no unsaved people there, generally speaking. Preachers have different ways to allow people to respond to an altar call: raise hand, come forward, talk with me after the service, etc. . .the form is not important as much as calling for a response in a non-manipulative way. When I do workshops on a person’s testimony and invite people to share their story to faith, an invitation to church is one of the many stepping stones in many stories that God has used to bring a person to faith. I remember one class with 8 students in it. Every single one mentioned a friend’s invitation to church that helped them to discover the grace of Jesus Christ. Sometimes we miss the elephant in the room. We as individuals are the Church, the bride of Christ, the ekklesia, the called out ones. . Strongs 1577 ekklēsía (from 1537 /ek, “out from and to” and 2564 /kaléō, “to call”) – properly, people called out from the world and to God, the outcome being the Church (the mystical body of Christ) – i.e. the universal (total) body of believers whom God calls out from the world and into His eternal kingdom. As a general rule, the building where the called out ones meet is not open to unbelievers. The evangelist brings the lost to Christ and sends them to the Pastor for discipleship. I actually had this same discussion with a friend today. I believed that unbelievers should not be allowed ‘in the gathering of the saints’… but so nicely Holy Spirit reminded me, that I was going to church as a drug addict looking for Christ. 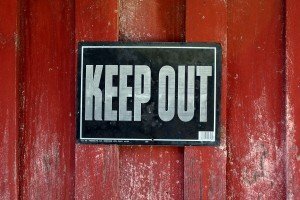 If I was told to leave or where not welcome… I dread where I would be today. Niki You experienced the right answer: where would you be if a church didn’t welcome you as you were? 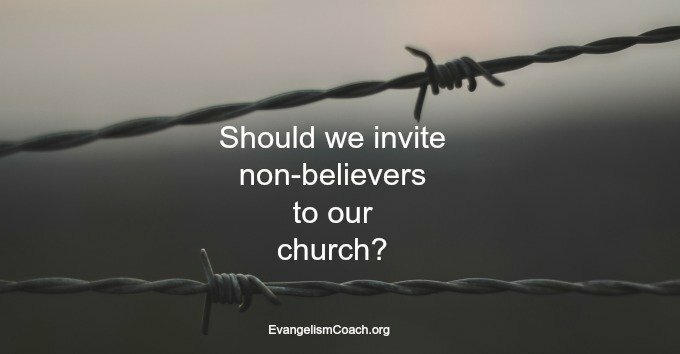 That story is probably the greatest argument about why invite and welcome unbelievers into your church – it is where they can hear the word, encounter the Lord, and experience the Holy Spirit draw them to a relationship with Christ. “You shall not plow with an ox and a donkey together.” This passage if taken in context, is speaking of not intermixing which is the same point the Apostle Paul is making. If the Church did what it was supposed to do by loving one another within the Body of Christ as the whole New Testament reiterates, then we’d see people drawn to the ways of God and the churches would burst at their seams. But instead of loving as we ought, we look for worldly ways to entice unbelievers to come to church to hear a message that may or may not include the actual Gospel of Jesus and we think we did our part. Actually our part as I see it, is to share the Gospel with them ourselves and let our lives after that be a testimony of the Jesus that dwells in us. Now if our friends desire to repent of their sins and be baptized into the family of God, well then I say, invite them in. Read Acts 2 as I think it gives a good picture of how it is to be done. Just one mans opinion. Blessings all. 1. What is the purpose of Church? Ephesians 3:10: so that through the church the manifold wisdom of God might now be made known to the rulers and authorities in the heavenly places. Ephesians 4:11-16: And he gave the apostles, the prophets, the evangelists, the pshepherds3 and teachers,4 12 to equip the saints for the work of ministry, for building up the body of Christ, 13 until we all attain to the unity of the faith and of the knowledge of the Son of God, to mature manhood,5 to the measure of the stature of the fullness of Christ, 14 so that we may no longer be children, tossed to and fro by the waves and carried about by every wind of doctrine, by human cunning, by craftiness in deceitful schemes. 15 Rather, speaking the truth in love, we are to grow up in every way into him who is the head, into Christ, 16 from whom the whole body, joined and held together by every joint with which it is equipped, when each part is working properly, makes the body grow so that it builds itself up in love. I don’t see a role for unbelievers in either the purpose or her function when gathered. Inviting unbelievers en masse eventually weakens the body and blurs the lines between Christians and non-Christians. Evangelism is the work of the Church when not gathered. Have a great day, all. Grace and peace to you.